My journey to where I am now has been long with many separate pieces that God has woven together into one path (that I could only see once all the pieces converged). I have felt compelled to help the poor since I was a child. I can remember begging my mom to buy gifts for kids on the “giving tree” at Christmas every year (which she did). Many years ago, I began volunteering locally and donating internationally to organizations that serve the poor. About 10 years ago, I started sponsoring a child in Ethiopia through Compassion International. In 2007, I was asked to join a group that had formed at Faith with the intent of finding a way to could fight poverty internationally but on a relational basis. We found Food for the Hungry and discovered that through its community to community program we could partner with a specific community. Part of that relationship involved child sponsorship. Since I had been sponsoring a child for many years already, I volunteered to take the job of coordinating child sponsorship at Faith. Shortly after that, I attended the Leadership Summit, which just happened to be focused on fighting poverty that year. I saw a video of a little girl in a yellow dress living on the streets of India. The care the little girl took of her little “home” on the street moved me in a way that I will never forget. So began the journey that I am currently on, which has been a blessing to me. 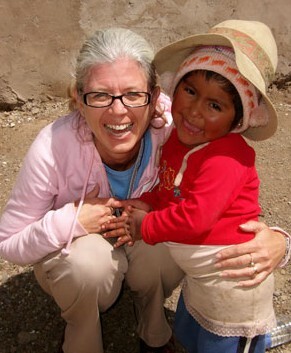 I have been to Bolivia twice, and I am now the Food for the Hungry advocate at Faith. I have fallen in love with the children and Food for the Hungry staff in Bolivia. I have seen the power of child sponsorship at work. God breaks my heart for the poor, and I believe that is God calling me to bless them and to be greatly blessed in return. I have the spiritual gifts of giving, mercy, creative worship, and administration. My passion is to help those living in poverty. I feel specifically called to help on an international level but am also called to help locally as well. I have a belief that whatever it is that breaks your heart is the place where you are being called to serve. My mission is to serve those who are living in poverty. I have felt a specific call to serve as an advocate for Food for the Hungry, encouraging people in our community to sponsor children in our partner communities in Bolivia. When we sponsor children in Bolivia, it brings me great joy. I consider it a blessing and a privilege to be able to serve in this way. I also help coordinate our local CROP Hunger Walk benefiting the work of Church World Service — a great organization fighting poverty locally and globally. Sponsor a child in our partner community in Bolivia through Food for the Hungry. Donate to special projects as needed for Food for the Hungry. Travel to Bolivia with one of our annual travel teams. Walk or sponsor a walker in the Foothills CROP Hunger Walk. To sponsor a child in our partner community in Bolivia you can contact me. To learn more, see the Food for the Hungry website. Volunteer or donate to fight poverty at the local level at the Denver Rescue Mission, The Action Center, or the Christian Action Guild (303-279-5674).